Roma’s new sporting director Monchi has announced that this will be Francesco Totti’s final season as a footballer 24 years after he made his first appearance for the club. 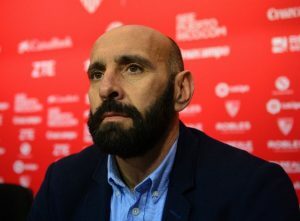 The 40-year-old midfielder, who has made more than 600 appearances for the club since his debut in 1993, has made only one start in Serie A this season for the coach Luciano Spalletti having been awarded a one-year extension in 2016. Speaking at a press conference on Wednesday, the club’s new sporting director, Monchi, confirmed that this would be Totti’s last season as a player but hinted that he could work closely with the former Italy international once the World Cup winner hangs up his boots. Totti’s final game will be on Sunday 28 May against Genoa at the Stadio Olimpico. He has won two Serie A titles as well as the Coppa Italia and Supercoppa on two occasions each during his 24 years with Roma. Appearing for his country at all levels from under-15, Totti scored nine goals in 58 senior appearances for Italy before his retirement from international football in 2006, after winning the World Cup in Germany. Totti, who did not comment on Wednesday and has not confirmed himself that he is ending his career at the end of the season, came on as a substitute in Roma’s 3-1 derby defeat against Lazio on Sunday. After the game, when asked whether that had been his last derby, the veteran midfielder said that it was not up to him and that “other people” were making those claims. 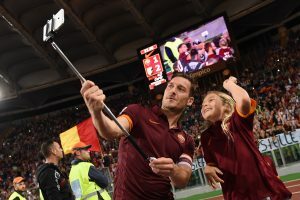 Mauro Baldissoni, Roma’s general manager, had told reporters before kick-off that Totti has a six-year contract to serve as a club director waiting for him, “so he’ll get to live many more derbies, only they’ll be off the pitch”.